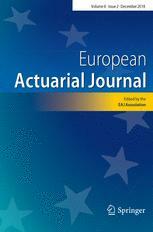 The European Actuarial Journal (EAJ) publishes research articles and survey articles as well as papers engaging the mutual transfer between research and practical applications. EAJ Volume 8 Number 2 containing 10 articles is now available! EAJ is designed for the promotion and development of actuarial science and actuarial finance. For this, they publish original actuarial research papers, either theoretical or applied, with innovative applications, as well as transfer papers on the evaluation and implementation of new mathematical methods in insurance and actuarial finance. Policy characteristics and stakeholder returns in participating life insurance: which contracts can lead to a win-win? EAJ is the successor of six national actuarial journals, so it is focused on theory and methods for applications in insurance and finance. EAJ publishes research articles, survey articles as well as papers for the mutual transfer between research and application.